A UK-based software product company asked Camdata to design a terminal with a small LCD screen and a full keyboard for their new DNC (Distributed Numerical Control) product, which interconnects a number of machine tools and gauges on the industrial shop floor with a central system, which provides CAD, CAE and production scheduling. RS485 was used to allow long distances in severely noisy electrical environments, with a Camdata MSLC in the central PC. A UK-based supplier of software to the sheet metal working industry used Qume terminals on a multi-user UNIX network and asked Camdata to modify a standard membrane QWERTY keyboard to interface to the Qume terminal. 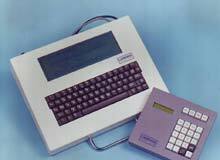 Camdata then manufactured in excess of 500 keyboards for installations throughout the UK.